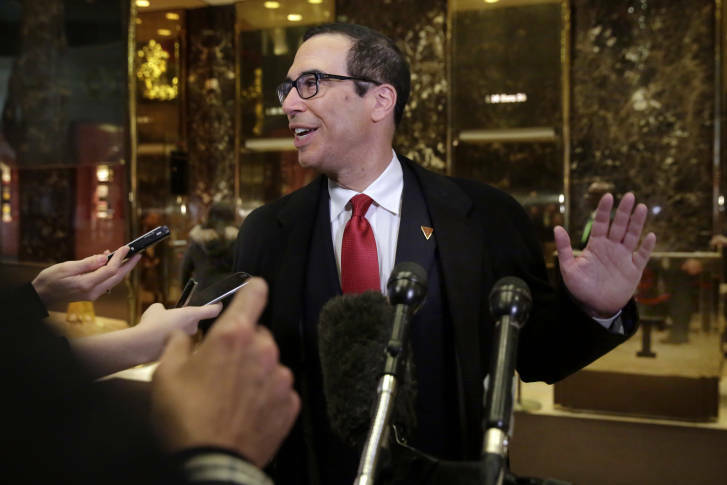 President-elect Donald Trump's pick for treasury secretary, Steven Mnuchin said Fannie Mae and Freddie Mac should be set free from government oversight. WASHINGTON — Stock in District-based Fannie Mae and McLean-based Freddie Mac each jumped more than 30 percent Wednesday after president-elect Donald Trump’s choice for Treasury secretary said the two should be set free from government oversight. Both stocks still trade at only about $4 per share. Fannie Mae and Freddie Mac have been under government conservatorship since being bailed out in late 2008. Their stocks were practically wiped out, but have been allowed to continue trading on the Over the Counter markets, at times since 2008 for just pennies. Both companies have been generating profits to the tune of billions of dollars per quarter in recent years, but under terms of their government bailout, both are required to turn over profits to the U.S. Treasury, in the form of dividend payments on the rescue money both received. Combined, Freddie and Fannie have paid $250 billion in special dividends to the U.S. Treasury on the stock in each of the companies the government holds. None of those payments have gone toward paying back the $190 billion their bailouts cost. Freddie Mac stock (OTCQB: FMCC) was up $1.12 to $4.14 in Wednesday midday trading. Fannie Mae (OTCQB: FNMA) was up 1.16 to $4.24 per share.